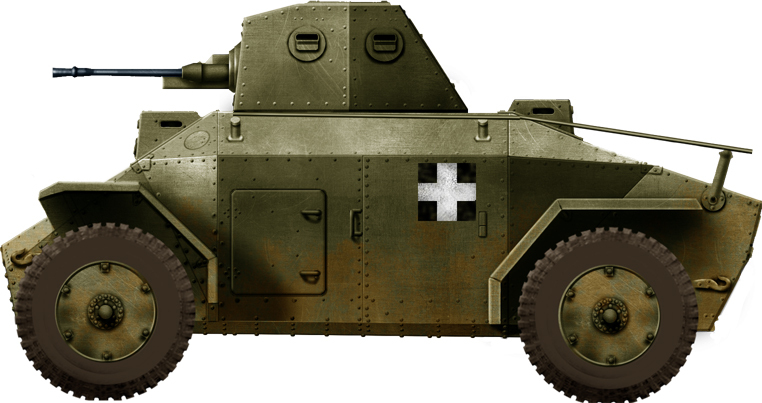 Miklós Straussler (1891-1966) was a talented Hungarian-born engineer, who designed and developed several armored cars and a hybrid tank concepts. From 1928 to 1933, he traveled frequently between Great Britain and Hungary, establishing the Folding Boats and Structures Ltd. He is better known as the father of the flotation screens used on D-Day kits, also used for other amphibious operations during the war. As a British citizen, he founded the Straussler Mechanisation Ltd in 1933, which produced the Alvis Straussler AC2 and the Alvis Straussler AC3 prototypes. The AC2 was perfected in 1936, and eventually tested, adopted and built by Hungary as the 39M Csaba. “Csaba” was the name of Attila’s son. 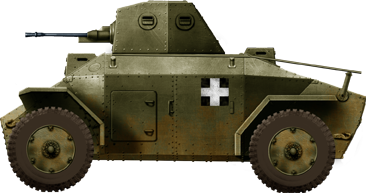 He also built the Hungarian Light Tank V4 prototype. The 39M Csaba emerged from an agreement signed with the Weiss Manfred factory of Csepel, Budapest, after Straussler’s design had been rejected by the British army. It was closely based on the Alvis C2. 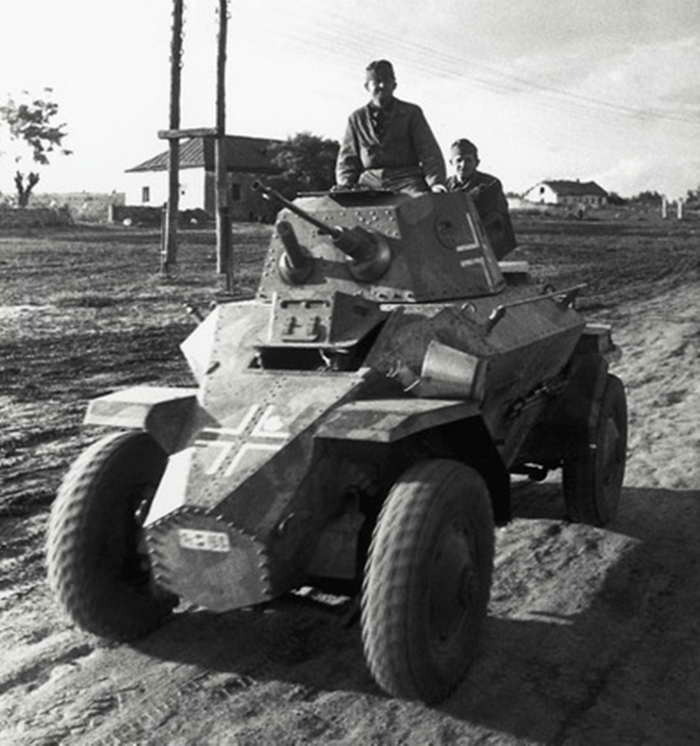 This was an independent suspension four-wheeled vehicle with a conventional framework wrapped in 9 mm (0.35 in) riveted armor plates in a sloped, lozenge shape, as can be seen from a front view. The protection was sufficient against small arms fire and shrapnel, but the main task of this vehicle was reconnaissance, not engaging enemy units. However, its armament was quite potent compared to the protection, with a 20 mm (0.79 in) Solothurn autocannon, also used by the first Toldi tank, comparable to the gun used by the German Panzer II. This was completed by a coaxial 8 mm (0.31 in) Gebauer 37/38M machine-gun, while a second one could be attached to a special AA mounting in the rear hatch of the turret. Normal provision was 200 rounds for the main gun, and 3000 for the machine-guns. The German Ford, 8cyl, 90 hp, 3560 cc engine was coupled with a 5 forward, 5 reverse gearbox, and carried 135 l of gasoline. It could climb a 30 degree slope and 1 meter (3.28 ft) high vertical obstacle, and had a 0.5 m (1.64 ft) maximum fording depth. 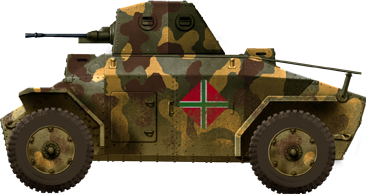 After successful trials, the Hungarian army decided to place an order for sixty-one vehicles, named after the year of introduction (39M). By 1940, a further order of forty followed. Half were later converted as the 40M command version, equipped with a R-4T long-range radio at the expense of the 20 mm (0.79 in) gun. This model was recognizable due to its large lattice mast. Production, according to some sources, was scheduled to restart in 1944 at Weiss Manfred, but apparently never did, although some recovered vehicles could have been repaired and refitted there in the meantime. The first 61 39M vehicles equipped the 1st and 2nd Mechanized Brigades, the 1st and 2nd Armored Divisions and the First Mountain Brigade. A squadron consisted of 10 vehicles, one command 40M and two training vehicles. The section of a mountain brigade consisted of three 39Ms. Except for the mountain brigades, the aforementioned units participated in Operation Barbarossa. 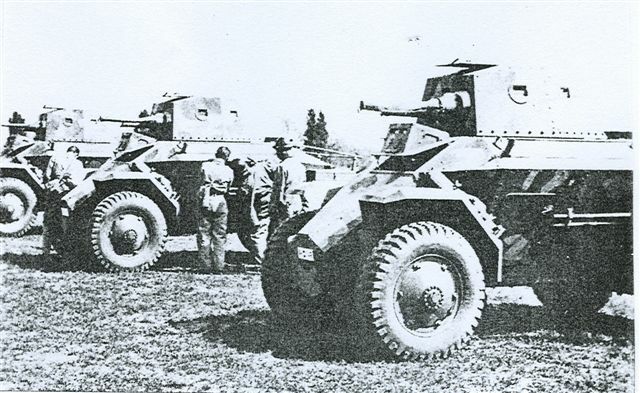 In December 1941, these units were reorganized and brought back from the front, with only 17 surviving Csabas. Combat experience showed that the weaponry and armor protection were insufficient for anything but reconnaissance. In December 1942, on the Don, the first Cavalry Brigade lost almost all its vehicle, 18 Csabas in all. 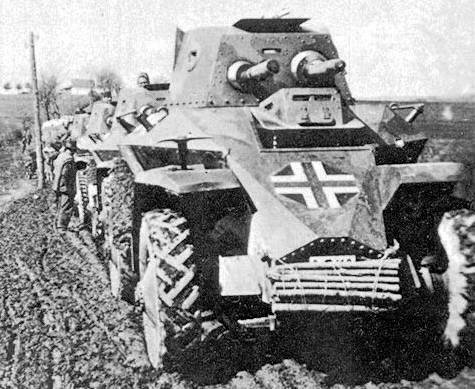 In April 1944, the second Armored Division counted 14 armored cars and was transferred to the Eastern front in August, but over 12 Csabas returned home. By the summer of 1944 the Army was left with 48 combat-ready armored vehicles. Four Csabas formed a section, of which one was a command one. These sections were assigned to four Hungarian infantry divisions. In June 1944, these sections fought in Galicia with the cavalry divisions, with 8 out of 14 returning from the fight. From the autumn 1944 their numbers gradually decreased. None seem to have survived the war. 39M Csaba. When the crew disembarked, the extra 8 mm (0.31 in) machine-gun was dismounted and taken with them. 39M Csaba, regular model, 1st Cavalry Division, summer 1941.